… or, if you go down to the pond today, you’d better… watch what you’re treading on. It’s approaching frog spawning season. Last year was a bumper year for frogs and spawn and I counted about 40 frogs thrashing about in the water above large quantities of spawn early in February. So a couple of times a week I go down to check for activity. Nothing so far but something is going on. Each spring we are visited by ragondin. Or coypu as they’re known in English. Myocastor coypus aren’t found in Britain so, like the fire salamander, they’re a bit exciting to us because they are practically exotic! In fact, they’re considered pests in France and are trapped and killed because of the damage they do to the banks round ponds and lakes. They burrow extensively and the banks collapse causing water loss. They are herbivores and while – in a wildlife pond – I feel that’s no bad thing as they eat grass, reeds, weeds and, best of all, brambles, if you have a precious garden with lots of rare (and tasty) plants, a couple of ragondin will decimate it in no time at all. Especially in spring as the new growth emerges. 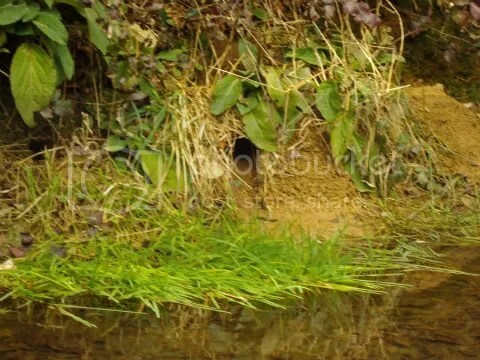 Anyway, our little (comparatively) pond gets a visit from 2 or 3 each April for a month or six weeks, they do burrow but realistically they do little harm in this short period before disappearing again. We’ve no idea where they go but we suspect they are trapped and shot at one of the larger lakes further down the valley before our spring runs on down into the river Sée. As we’ve a couple of healthy and pretty water lilies now, we are quietly pleased that while we get the interest of a visit, it’s over before damage is done. With the thick tail, they may look slightly rat-like. They’re not – they’re more like an amphibian rabbit with a longer tail and very powerful back legs which make them strong swimmers. The average size of an adult ragondin is 50cms (20 inches long) with a tail of about 40cms (15 inches). They’re crepuscular (active at dawn and dusk) very shy, they’re herbivores – so don’t damage the animal wildlife in the pond – only the plantlife – and were introduced to France in the 1800s by furriers who were interested in farming it for its pelt. Anyway, the point of explaining about the ragondin before getting to the point of the jelly… not to mention the caviar… is that something is excavating burrows round the pond and as it is very early for the ragondins to make their annual pilgrimmage, I’m not entirely sure it’s them. 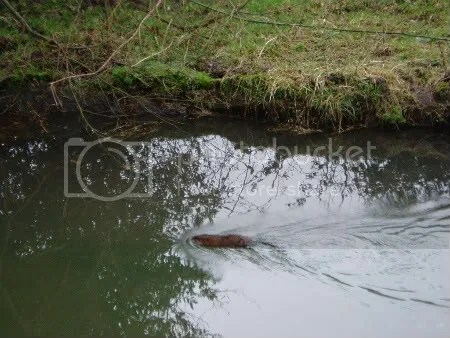 As ragondin only eat plants – and they trim foliage neatly – we’d expect to see some of the grass at the pond margins trimmed by very sharp teeth and typically we see fronds of grass floating in the pond. This year we’ve not seen that evidence. 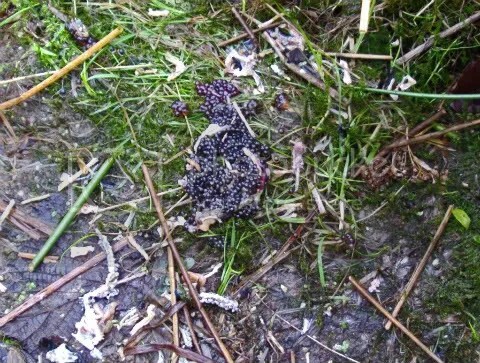 And, about half-a-metre away was a pile of what looked like (but could not be) semi-digested blackberries… or caviar. The caviar reference is likely to be closer to the fact. Caviar is simply the unfertilised eggs (roe) from various fish (most popularly the sturgeon) which is an expensive culinary treat. It is likely that the eggs are above are from a frog and if the frog had lived would have become frog spawn. Something has killed a frog that was ready to mate and spawn. For whatever reason, it did not eat the eggs or the jelly. When frogs mate, usually in water, the male grips the female around the chest and waits for her to release her eggs. He fertilises them as they emerge and the jelly gradually forms around them to protect the eggs and hydrates in the water. The jelly in the photo above has probably absorbed water over several days and turned into the large blobs (maybe 2cms (about 1 inch) in diameter in contrast to the normal, smaller frogspawn “blobs”. In addition, and the photo isn’t that good, if you look at the “caviar” photo, below the eggs and to the left are a number of bones – frog bones. There are bits of spine that are clean of flesh. Something has very efficiently stripped the meat from the frog and either left – or perhaps regurgitated – the bones. So we think we’ve got a deconstructed frog, eggs and frogspawn jelly. But what ate the frog? Not ragondin, that’s definite. 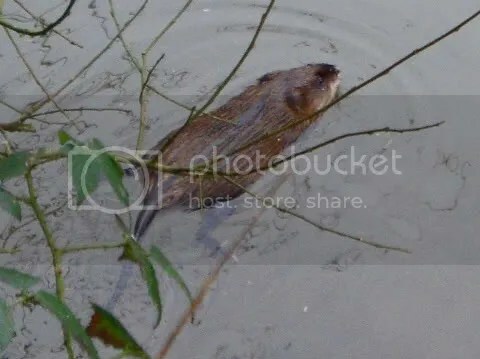 Possibly muskrat: Ondatra zibethicus – similar situation to the ragondin, the muskrat was introduced to France in the 1800s by fur farmers. Predictably it escaped and has spread across France. Also classed as a pest, like the ragondin it causes damage to ponds, lakes and waterways and apart its excavations can block up streams and cause severe flooding. Although mainly vegetarian, it will eat amphibians, fish and other pond wild life. Or perhaps it’s a polecat? But that would not explain the burrows into the pond bank. Buzzards and herons will eat frogs and regurgitate what can’t be digested. And I did see buzzards down at the pond last year when the frog mating activity was at its height. But against that is the fact that one heap of “stuff” was outside one of the burrows and was not accessible by a heron or buzzard. So what have we got down there? I don’t know. I’ve lurked quietly in the brambles several times at twilight – though the weather is a bit cold for lurking. In previous years my patience was rewarded by sight of the ragondin, I’ve not been lucky enough to see anything this time. I’ll have to persevere because I’d love to know what we’ve got digging and dining down there.